Smart Lake 200 L 2 | Efficient Sonics Ltd. 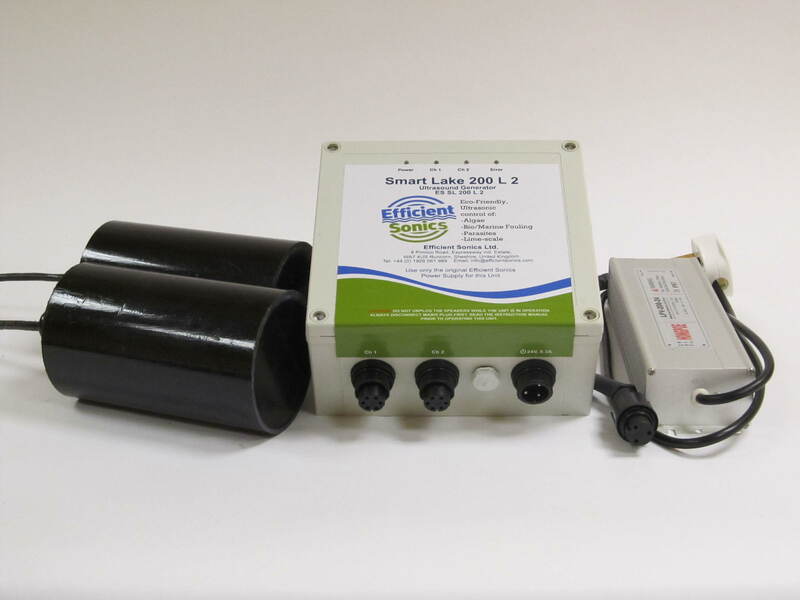 The Smart Lake 200 L 2 is specifically designed to remove existing algae and prevent new algae growth in lakes. The Smart Lake 200 L 2 has two single outputs of 50 Watts and comes with two large transducers giving a range of up to 2 x 200 metres. Included is a 24 Volt Mains Power Supply, Mains ac version: 170 V to 240 V ac, 50 or 60 Hz, or: 100 V to 120 V ac, 60 Hz. The Smart Lake 200 L 2 has the unique Smart Tune Technology, which automatically re-tunes the system for optimum performance every 6 hours, or other interval as requested. A Portable Ultrasonic Meter and a USB-Microscope are available for purchase with this product, so you are able to check the installation and ensure that the system continues to work effectively. You can purchase this product together with a range of optional extras including extension cables, floats and mounting clamps by contacting us.